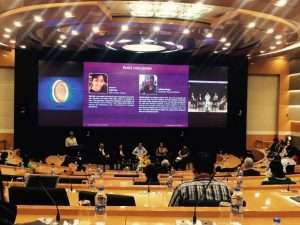 Bengaluru: Six researchers were about to be honoured with Rs 65 lakh each at the ninth edition of the Infosys Prize, and this author had been invited to participate in the subsequent panel on popularising science. The path to the venue was against a heavy flow of oncoming Indian software engineers, all making their way to their respective cubicles at the Infosys campus in Bengaluru. The audience was saturated with local school children in uniforms taking in the enormity of the occasion. In the afterglow of a lecture on gravitational waves, they were being addressed by Murthy, sometimes called India’s father of IT at one of the biggest and successful companies of the country. There was a considerable media presence and projectors, screens and microphones were running smoothly. There was also word around the room that this is the wannabe Indian Nobel Prize. When asked for the press release, one of the PR officers said cheekily, “Not yet!” Seconds later, the laureates were announced and it all made sense. As the coauthor of a popular science initiative that profiles unsung Indian women in science, I often question the underrepresentation of women in senior science positions and science prizes. For example, in the last decade, only seven women have won the Shanti Swarup Bhatnagar Prize out of 113 recipients. So I was in attendance with many expectations. Some were met, some not. The Infosys Prize this year is different from the rest. Among the six winners, three are women – a 50:50 split of the gender binary. This had happened in 2013 as well but none of the three women prize winners that year had won for the pure sciences (two won in the humanities category and one in social sciences). One of the shining stars this time is Sanghamitra Bandyopadhyay, the director of the Indian Statistical Institute (ISI), Kolkata, winning for ‘engineering and computer science’. Bandyopadhyay also won the Shanti Swarup Bhatnagar Prize in 2010. She is recognised for evolving algorithms to analyse biological data. With her work on optimising data analysis, she was able to make exciting discoveries, like a new genetic marker for breast cancer. Her work has been used in software built by the US Environmental Protection Agency to detect water contamination, according to a press release. 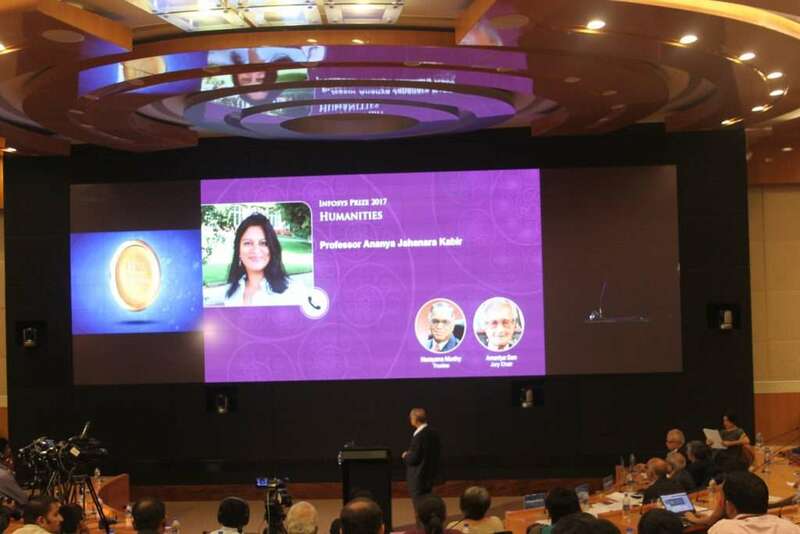 “She sets an inspiring example of high quality original research in computer science done entirely in India that has had a worldwide impact on science and society,” said Pradeep Khosla, one of the jury chairs for the prize. The prize in the physical sciences went to Yamuna Krishnan, acknowledged by ISF as a “recognised leader” in the field of making useful nanostructures with synthetic DNA. This category recognises work in varied branches like physics, chemistry and earth science combined – since research is becoming increasingly interdisciplinary and is crossing traditional boundaries, as the ISF said before announcing the winner. Krishnan is also a recipient of the Shanti Swarup Bhatnagar Prize, in 2013. Ananya Jahanara Kabir, a professor at Kings’s College London, is the third woman winner of the Infosys Prize 2017. On video, Amartya Sen announced her name by lauding her interesting work on historical elements in the reality of colonial and postcolonial identity. “She has shown how elements of tradition mix well and must be seen as a part of modernity of ourselves today,” he said. “Oh my god. This is not a joke? I’m speechless. I hope that I will be able to start leaving something of a legacy,” she said while accepting the award, over a recorded message. The award in the ‘life sciences’ category, announced by first time ISF trustee Nandan Nilekani, went to Upinder Bhalla, a neurobiologist at the National Centre for Biological Sciences, Bengaluru, for his work that helped understand how the the part of the brain that processes smells computes. Under his belt, Bhalla has several discoveries from experimental results, including one a way to track food, predators and mates with smells. For the same work, he also won the Shanti Swarup Bhatnagar Prize in 2007. Dinesh announced the prize in the category of the ‘queen of sciences’, a.k.a. the mathematical sciences, to Ritabrata Munshi, of the Tata Institute of Fundamental Research, Mumbai, and ISI Kolkata. His work seemed too complex for ISF to simplify right there; its officials promised it would translated into cartoons and graphics soon. Early next year, the prizes will be formally handed over to the distinguished scientists in a ceremony attended by Kip Thorne, the famous astrophysicist who set up the physics in the movie Interstellar (2014) and will soon be himself a Nobel Laureate. In a time when prizes – Nobel or otherwise – awarded to women scientists are rare, it was heartening to see more women faces on the Infosys prize pedestal. But the reiteration of the already established recipients of high profile prizes, that too from a tiny pool of past women science prize winners, is heartbreaking. “We aim to recognise and reward talent early,” Dinesh had said while introducing the prizes. However, the recognition of early talent is sparsely reflected in this year’s prizes. This year, no women will receive the highly coveted Nobel Prize. At a listening session for Indian women in science the day after the Infosys prizes were announced, Roopmanjari Ghosh, the vice-chancellor of Shiv Nadar University, Dadri, said, “Science prizes for women in excellence are fragile peaks that are easily collapsible since a broad base of women in science is not there.” However, reports by The Life of Science initiative have shown that there are enough women spread across India doing exceptional scientific work. The starter culture for a healthy, broad base to hold firm strong peaks exists – but is currently ignored because we are busy looking elsewhere. We have to ask: are we doing enough for women in science in India or are many being left behind?